Saitama city is one of the ordinance-designated cities. Its population is close to 1,300,000, the ninth in Japan – and still increasing. Saitama city is located in the region of Kanto – right North of Tokyo. The distance from the center of Tokyo to Saitama city is only 20-30 km so Saitama has been developed as a commuter town for Tokyo. In 2001, Urawa city, Omiya city and Yono city combined to become Saitama city. In 2005, Saitama city merged with Iwatsuki city, to become what it is now. Saitama city is known for having a “Bonsai town”. After the great Kanto earthquake of 1923, several bonsai companies carefully chose that place, which was spacious and had clear air and water, and they moved into there together. 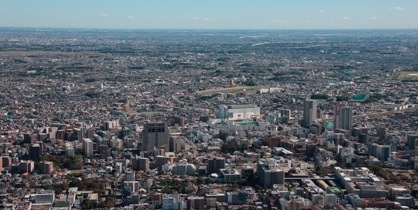 Saitama prefecture is the fifth in population and its density is the fourth in Japan. Saitama prefecture has 40 cities, which is the most in the country. Most area of Saitama prefecture is covered by the Kanto plain. Only Chichibu city is in the mountain side. In 2014, the number of international inhabitants was 130,092. Saitama University is a national university – they accept a great diversity of international students. Saitama doesn’t have particular unique characters in general, but if you want to have a good balance between convenience and living cost, it could make you comfortable.